We impart knowledge and skills to develop character, personal leadership, enterprise and work ethic, and values so children can create their own success as thoughtful, confident, principled and dynamic individuals in the world. RIS is a leader in Positive Education (PosEd) which is a paradigm shift in global education. Research has shown that happiness is the key to lifelong learning and success. PosEd is based on outstanding teaching and the science of positive psychology, happiness and well-being. The philosophy of PosEd permeates every aspect of our school, enabling Regent children to flourish learning skills for ‘Academics and Achievement’, such as critical thinking, literacy and numeracy, as well as the skills for ‘Character development’ and ‘Wellbeing’, such as resilience, confidence, self-esteem, happiness, kindness, gratitude, discipline and a strong work ethic. RIS is a STEAM (Science, Technology, Engineering, Arts and Mathematics) school and captures where education is at today – where science and mathematics converge with the arts and humanities as well as digital technology to nurture students into tomorrow’s generation of thinkers and innovators. RIS is a completely technology-enabled school. Technology is used in every aspect of the education from planning and delivering the curriculum;, monitoring and assessing standards; collaborating and sharing information amongst teachers, students and parents; and monitoring students’ education, progress and behaviour at school. Our education programme is further enhanced by MultiSmart Learning™, a high impact education programme developed by our teachers, which nurtures multiple pathways to learning and develops multiple intelligences triggering all-round child development. Our Creative Learning Programme consists of art and design, creative writing, music, debate, drama, dance and ballet, as well as a host of new media initiatives such as radio production, music production, online podcasts, and social and digital media marketing. We have a strong and diverse programme of more than sixty sports, co-curricular and extracurricular activities that develop a child’s confidence, character, teamwork and interpersonal skills, sportsmanship and cultural understanding. Our programme is supported by excellent sports facilities and an impressive line-up of sports instructors and teachers, many of whom have been county athletes. 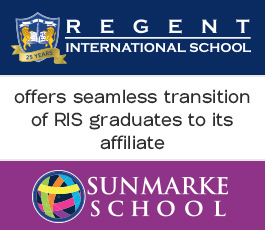 Regent International School (RIS) has been established for over two decades and has been consistently delivering a high quality education to thousands of students. RIS has a dynamic senior leadership team and passionate team of teachers trained in Positive Education and global best practices in education. We employ a strong customer focus that encourages a culture of accountability to ensure that our children are happy, achieve their potential and enjoy school; parents are positively engaged; and teachers are fulfilled by their work and motivated to deliver their daily best. 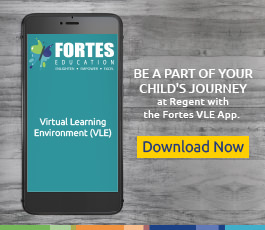 As part of Fortes Education, RIS has the advantage of selecting from a large pool of teaching applicants. We employ only motivated and dynamic leaders and teachers with a proven track record of delivering a world-class education. RIS continuously invests in teacher training and professional development to ensure staff are kept abreast of the latest developments in modern pedagogy.